Oshiomhole said the two Governors are upset with him because he refused to support their undemocratic tendencies. The chairman of the All Progressives Congress (APC), Adams Oshimhole has come down hard on two Governors in the party. According to Punch, the Ogun state Governor and Imo Governor, Ibikunle Amosun and Rochas Okorocha respectively, had made comments in the media attacking Oshiomhole over the party’s decision on the governorship primaries held in their states recently. In his reaction, Oshiomhole said the two Governors are upset with him because he refused to support their undemocratic tendencies. The APC chairman said this while speaking to newsmen on Friday, October 2, 2018, in Abuja. Okorocha, while reacting to the APC’s decision, said the party has been going on a downward trend since Oshiomhole took over its affairs. Punch reports. Oshimhole however dismissed the Governor’s comment, describing him as an embarrassment to the ruling party. Reacting to comments by the Osun state Governor, Oshiomhole said Amosun was trying to act like an emperor. The APC chairman also described the actions of the Ogun state Governor as immoral and undemocratic. Amosun had earlier accused the APC chairman of working for the Peoples Democratic Party (PDP) to pull the ruling party down. In his response, Oshiomhole said “At the meeting, this is no secret, I expect that some of your media houses will have video clips of what transpired at that meeting because it wasn’t a closed-door meeting, it was an open meeting. Governor Amosun in his wisdom decided to introduce ‘third element’ which didn’t feature in the resolutions of the National Executive Council. “He went on to also announce that the second Senator also, from Ogun State will step aside and another gentleman will come in place of that senator. And according to him, this pronouncement is a consensus. “Not done, governor Amosun went on to announce a particular gentleman, who will be the next Speaker. He went on to announce another one who will be the next deputy Speaker of the state House of Assembly. “Our constitution does not recognise emperors. There are not emperors in the APC, if anybody attempts to invent himself as an emperor, it will be an enterprise in futility. 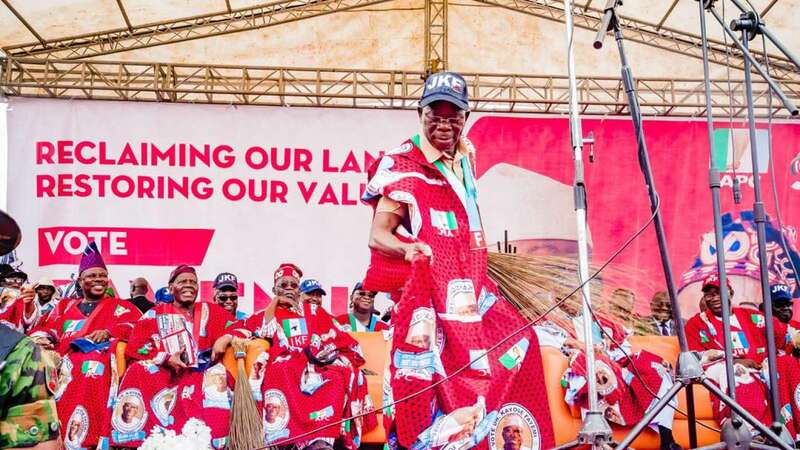 “Based on our rules, we have since conducted primaries and submitted the name of the winner, Prince Dapo Abiodun, to INEC for the purpose of the forthcoming governorship election that for me has concluded that matter,” Oshiomhole added. The APC chairman also said that he will not mortgage his conscience in order to keep his job. The former Edo Governor, was elected as the chairman of the ruling party during its national convention which held at Eagle Square in Abuja on Saturday, June 23, 2018.